Taking place at the Grand Harbour Hotel in Southampton, the fast moving programme brings together an international group of 25 experts armed with the latest knowledge to identify problems that affect the maritime sector worldwide - and highlight potential solutions! The aim is to address the fact that in recent years less people are expected to do more work in less time and to ensure that safety remains paramount. 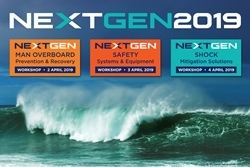 NEXT GEN Workshop days are relevant to workboats, pilot boats, patrol, search & rescue, survey, wind farm support, superyacht tenders, training and charter vessels. UK attendees include Royal Navy, Ministry of Defence, Border Force, HM Coastguard and the RNLI. International attendees include professional and military organisations, boat builders, equipment manufacturers, service providers and classification organisations. There is a discount for members of British Marine, UKMPA, RINA, YBDSA, UKHMA. Supporters of the event include UK Maritime Pilots, University of Southampton and Southampton Solent University.